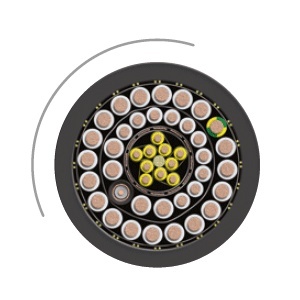 The Hradil curing cable can be used on the UV curing drums like KASRO UV curing drum BASIC/BASIC PLUS and KASRO UV curing drum PROFESSIONAL in standard lengths of 130m to 300m. The 20.2 mm thick Hradil curing cable is suitable for UV curing systems from ProKASRO and can be mounted on the UV curing drums KASRO UV curing drum BASIC/BASIC PLUS with a length of 130 m (optionally 200 m) and on the KASRO UV curing drum PROFESSIONAL with a length of 200 m (optionally 300 m). 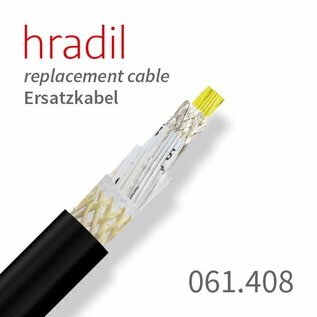 The Hradil curing cable is designed with a total of 44 wires plus a coax cable for high mechanical loads and a long life. It is well protected by a Vectran braid and a PUR coat with a special TPU mixture, so that even in case of a damage to the outer shell, max. 1% moisture will be absorbed.